Designed by Tom Fazio with effort to maintain original topography, streams and the thick mature border of trees. The fairways are sodded in thick Bermuda and the greens are dense with the most advanced available bentgrass. White Columns Country Club has received many awards for their golf course and with good reason. With each hole featuring four sets of tees, White Columns can test experienced players while offering just the right level challenge for those less skilled. Play gets increasingly tougher and more beautiful as you make your way through your 18 with a grand peak over the last five holes. Large greens are moderately undulating with some greens and tees that are elevated. 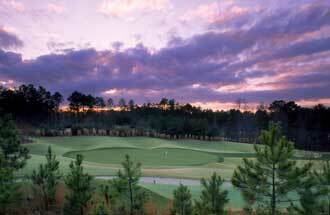 Hosted the 2009 Men’s State Mid Amateur and the 2010 State Women’s Amateur Tournaments. With a multi-million dollar renovation completed in 2011, White Columns Country Club maintains its splendor with updated appointments and facilities. The White Columns Clubhouse is spacious and offers stunning views over several holes, both fine and casual dining and a bar, plus outdoor covered and uncovered patio tables. The Verandah Club is the separate athletic/recreation clubhouse facility which sits on 8 acres and has a junior Olympic pool, separate covered "kiddie pool" with lifeguards, snack bar, and swim team that went undefeated in 2011. It also has 7 lighted tennis courts all resurfaced (2011). It has a fitness center with all new equipment (2011). There's a children's playground with all new equipment (2011), a basketball court and plenty of space for social activities and events. The over 400 Atlanta country club homes here sit on large one acre+ lot sizes with shingled and sided homes, some featuring wraparound porches, traditional brick homes and a few with European stone styling. There are four unique neighborhoods in White Columns, including the golf course and gated neighborhoods. You'll also appreciate the mature landscaping and the serenity it brings to this wonderful family oriented community. Atlanta homes here are priced from $500k to $1.5m.